There is only one trend I am falling for this year is VELVET. This 90s trend has definitely made a comeback this fall/winter: from velvet booties, OTK boots, to velvet clothing pieces. 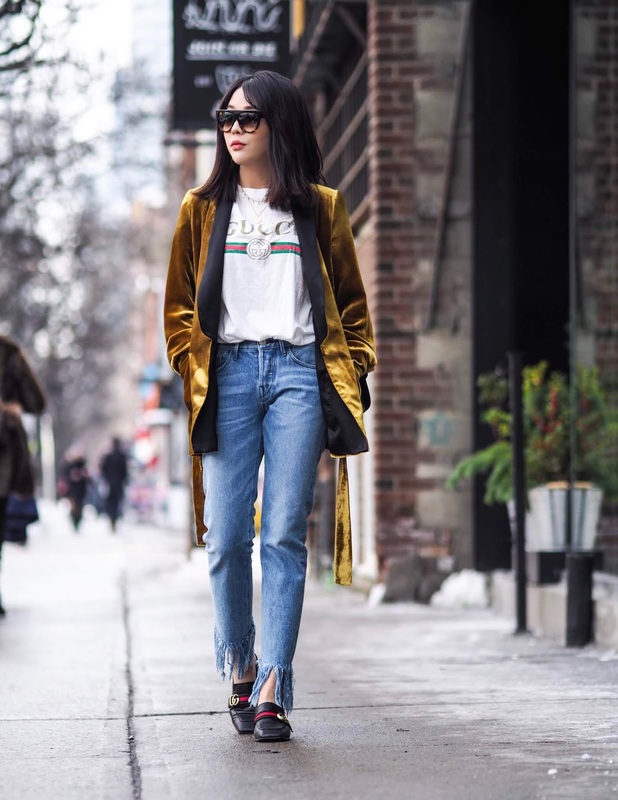 Today I am styling my mustard velvet blazer with my favorite Gucci tee, a pair of fringe hem jeans, and my Gucci loafers. Velvet piece is perfect to mix into your daily streetwear. For those who aren’t very experimental and would like to play it safe, a velvet dress is the way to go. Have fun playing with different textures! Those jeans are so cool! Love em with the Gucci tee and the velvet blazer on top! Obsessed with velvet this year!!! Velvet is definitely one of my fave trends too! Love how you have styled the velvet blazer hun! But all I can look at is the Gucci combo hahah Nice outer! Those fringed pants you are wearing go so well with the tee, which in turn complements the velvet jacket nicely!